Feb. 9, 2018 – Today the U.S. geothermal heat pump (GHP) industry scored a victory for its workforce and their employers as federal legislation was passed to extend federal tax credits for residential and commercial installations of GHPs. 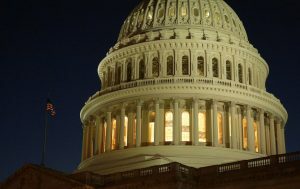 The measure was included in the Continuing Resolution spending bill approved by Congress. The reinstated GHP tax credits are retroactive to Jan. 1, 2017, and extended to Jan. 1, 2022. The language also changes an important consideration for commercial GHP projects, making them eligible if commenced by Jan. 1, 2022 rather than placed in service. “Today’s action by Congress finally fixes the inequity created two years ago when tax credits for solar installations were extended through 2021,” stated Geothermal Exchange Organization (GEO) President and CEO Doug Dougherty, “Credits for technologies including GHPs, fuels cells, microturbines, small wind and combined heat and power were left to expire at the end of 2016. Since then it was an uphill fight, as GEO and its allies worked diligently for parity with the solar industry through bills in both the House and Senate. GEO’s message to legislators was ultimately heard: Congress shouldn’t be picking winners and losers when it comes to renewable energy and fairness in tax policy. “And now we have finally achieved parity with solar,” said Dougherty. Coalition partners included all of the “orphaned” clean energy technologies, and among others, the National Rural Electric Cooperative Association, the National Association of Homebuilders, and the Air Conditioning Contractors of America. In the days prior to passage, GEO joined a larger coalition of business, energy, transportation, real estate, and agriculture stakeholders who gathered forces to make their case for including tax extenders in the CR that passed the Senate and the House. GEO’s relentless campaign to regain GHP tax credits included several Executive Fly-Ins to Washington DC in 2017, plus GEO Board Members, staff and industry volunteers making hundreds of visits to House and Senate legislative offices. Grassroots efforts by GEO members and supporters included job site visits set up for key legislators to show them firsthand the value of GHPs and plead the industry’s case for tax credit parity with solar. “Achieving this critical milestone for our industry couldn’t have been accomplished without the positive and aggressive leadership of GEO staff, GEO manufacturers and members, our DC lobbying team—and the tireless efforts of my fellow board members during several Fly Ins to Washington during the past two years,” said GEO Board Chairman Joe Parsons (EarthLinked Technologies, Inc.).